Earlier this month, Timor-Leste published its Extractive Industries Transparency Initiative (EITI) Report for 2012. The report was celebrated by the international EITI Secretariat and the government of Timor-Leste as an advance in public information about oil and gas revenues "including more comprehensive information than ever before." Unfortunately, it is actually a step backwards from the amount of transparency in the 2010 and 2011 reports. Although it has more already-public general information on oil and gas projects in Timor-Leste, it has much less on the specific payments by the companies to Timor-Leste's government, which is the principal purpose of EITI. The previous two reports contained more detailed data than the companies wanted, and they were outvoted when the Multi-Stakeholder (companies, government and civil society) Working Group decided to publish them. When the framework for the 2012 report was being discussed, civil society urged that it again be disaggregated by product and revenue stream -- but unfortunately the companies prevailed this time. At the report's gala launch in Hotel Timor on 6 February, ConocoPhillips representative Jose Lobato was delighted that it responded to company wishes, unlike previous reports. Global EITI Chair Clare Short spoke about how important EITI is in other countries, and how Timor-Leste has been a leader for them. 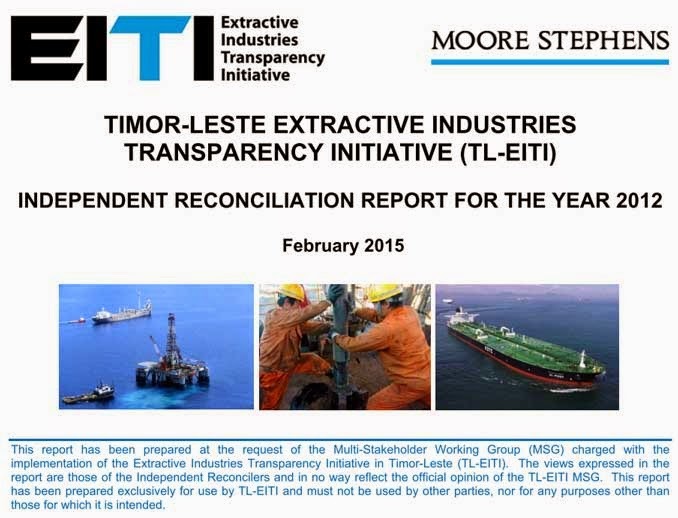 Timor-Leste published its EITI report for 2012 five weeks late, according to EITI rules. The latest report contains significantly less information than the 2010 and 2011 reports, with FTP (royalty) combined for all products (gas, condensate and LPG), and each company subsidiary's payments given as one lump sum. In most cases, it contains less revenue data than Timorese agencies had published more than a year ago. The 2012 report laments that recommendations in previous reports have not been implemented, including creating a database of companies and conducting a scoping study prior to reconciliation. It makes new recommendations to create a legal framework for EITI in Timor-Leste, add detail to the reporting template, start working on the report earlier, and clarify confidentiality agreements demanded by the companies. Although these recommendations would improve technical implementation, they do not protect transparency. The report confirms that oil companies paid $266 million to Timor-Leste in 2012 for taxes due in prior years and associated penalties. These are being appealed, and Timor-Leste may have to return this money (and perhaps more) if the companies continue to prevail. The two graphs which follow are based on information published by the National Petroleum Authority, Central Bank and Ministry of Finance. That data is not in the latest EITI report, which only covers 2012 and has no monthly data, revenue source breakdown or production information. We appreciate that Timorese agencies remain more transparent than EITI on oil and gas receipts. Timor-Leste's petroleum revenues peaked in 2011 and 2012. They dropped 15% in 2013 and 42% further in 2014. Although some of the 2014 decline was due to world market prices, a more important factor was the 24% drop in production because the fields are being exhausted. Bayu-Undan and Kitan have less than five years of production remaining. Timor-Leste has saved more than $16 billion of its oil and gas revenues in its Petroleum Fund, but, for the first time in the country's history, the balance in that Fund fell during the last half of 2014. Celebrating two-year-old EITI data ignores this disturbing reality. During the past year, Timor-Leste's government has reduced publicly available information regarding procurement, macroeconomics, poverty and other areas. We hope that the new Prime Minister and Minister of Finance will reverse this trend, but it will be a struggle. La'o Hamutuk recently published an article with some lessons based on TL's experience. The international EITI article expects that the 2012 EITI report "will catalyse fresh investment for exploration and production in [an] upcoming bidding round" for offshore oil and gas exploration blocks. However, Timor-Leste officials have promised a bidding round for "the coming year" since at least 2010; the last one was in 2006. Although it is possible that Timor-Leste's constrained land and sea territory contain significant undiscovered reserves, it is unlikely. Clearly, it would be foolhardy to base hopes for future development in this extremely petroleum-export-dependent country on the faint chance that large deposits were missed during decades of seismic exploration and dozens of dry test wells already drilled. Today's news that Woodside is suspending work on Greater Sunrise should be a signal to everyone.